Our purpose is to conduct surveys and research pertaining to transportation policy. The primary focus of our studies is the movement of people and goods that are a vital part of the socioeconomic activities of the nation. This research is studied from a perspective consistent with current needs. Research is conducted primarily through the efforts of our regular and associate members and by securing the participation of key outside partners. Research projects include topics selected from proposals submitted by members and includes research conducted in collaboration with associate members. Another purpose of our mission is to cultivate and mentor aspiring young researchers. Special research focused on themes of particular societal concern is often chosen for study. The outcome of our research is the formation of Transportation Policies for entities concerned with improving the quality of life. These entities include national and local governments, concerned institutions and various other organizations. Basic functions of this public service corporation are the reporting of the results of our surveys and research. Results will be communicated through symposiums, forums, lectures and other events. Reporting of research activities and deliverables will be provided on a summarized basis. Research carried out in formulating transportation policy requires the selection of themes based on underlying socioeconomic conditions of a given time. In recent years, we have been defining and grappling with specific themes concerning various challenges with which we are faced. Examples of such challenges include the prevention of global warming, preservation of natural resources and energy, social and economic impacts of a dwindling birthrate, changes in population demographics (aging and shrinking population), development of a safe and comfortable transportation system, streamlining and globalization of physical distribution, expanding inter-regional gap between outlying regions and urban centers and funding issues concerning road maintenance and improvements. Research of Transportation Policies that improve safety, comfort and mobility. The study of Transportation Policies consistent with environmental, energy, national, regional and urban policy. Research and development of financing policy. Studies that include independent research, joint research, research conducted by young researchers, special research, commissioned research and proposals. Holding forums, joint research workshops, lectures, symposiums and other events where research results and findings can be presented. 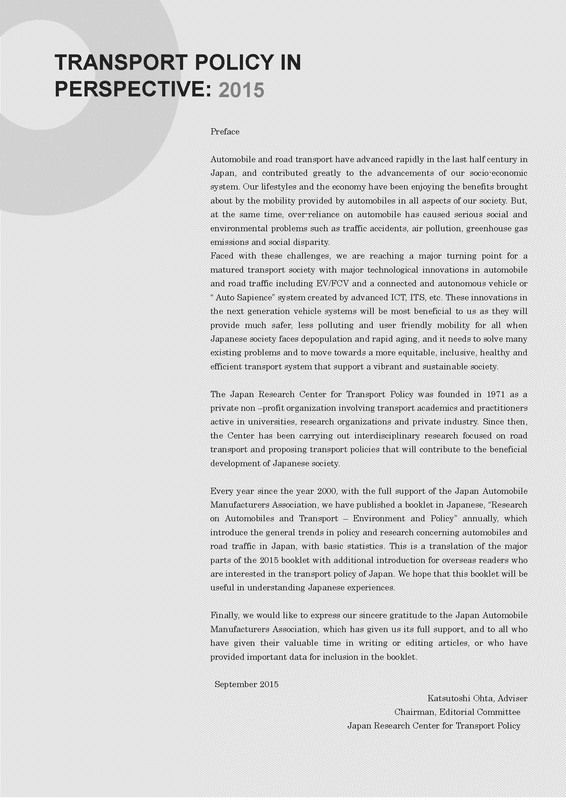 Copyright(c) The Japan Research Center for Transport Policy, All Rights Reserved.